You guys! I had the MOST productive weekend ever! Seriously, the husband and I (mostly him) got much of the downstairs bathroom completed, finished up several projects around the house, started a few more and got a few more pictures hung on the wall. I’ll have updates on a lot of those projects coming this week and next, so stay tuned! Baby’s Size: Baby Girl is almost 2 pounds and 13ish inches long. There really isn’t a fun fruit this week. Baby’s Progress: She can now see, but since its really dark in there, there isn’t much to see. Her lungs are developing more and gaining more fat every week… better for those chubby cheeks and fat legs I love about babies. Weight Gain: I gained 0 lbs this week. Not sure how that happened. I definitely have not been restricting on the diet! Sleep: Sleep hasn’t changed much from last week. I should really learn to quit drinking so much water right before bed, but water always sounds so good and its not that bad to get up a few times in the night. Milestones: We finished painting her crib this week, so now we just have to move it up to her room and assemble it (and get a mattress) and she’ll have a place to sleep when she arrives! We are also under 100 days until her due date, which feels like a really long time and a really short term all at the same time!!! 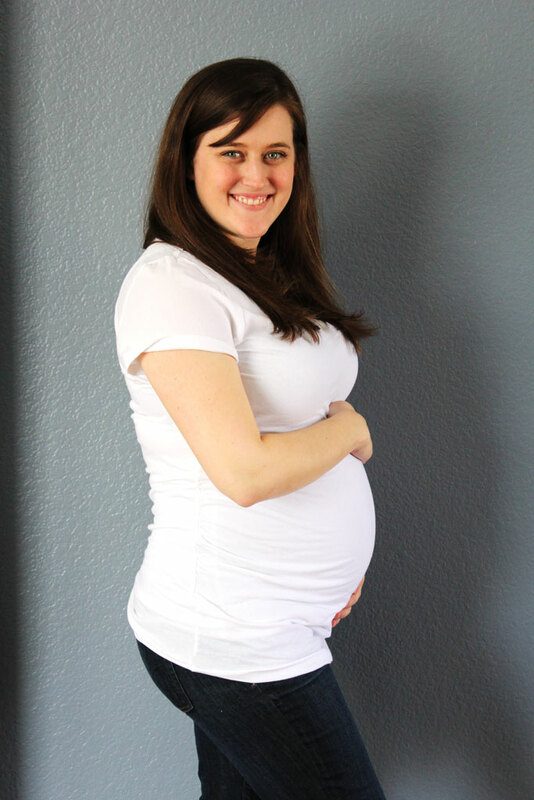 Symptoms: A couple of times this week I was hit with waves of nausea again, so I’m hoping that was a freak occurrence and that it isn’t coming back for the 3rd trimester. And I can burp like a teenage boy, but overall I feel pretty good. Workout: I’m still walking and being pretty active working on the house and other things, but didn’t really go workout much this week. Maybe I’ll be better next week?